ADC announced its release of ZFS on Mac OS X few day ago. As we know, Leopard arrived with zfs read only support (few month ago, the rumor is ZFS to replace HFS+) . But, with this developer seed you can create pool and read/write your zfs partition. To create pool, you must have two physically device, not two file systems. My Assumption, you can make backup partition (Time Machine ?) 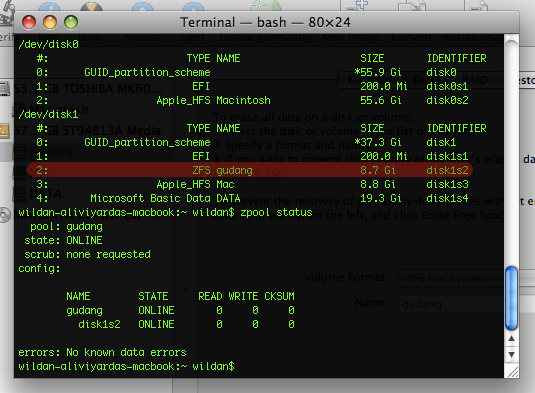 with ZFS Pool on Macbook using two USB ports and two Eksternal HDD. This is still developer version, so don’t use your ZFS partition to backup your data. Sepertinya Leopard sudah ada yang pakai ya?? Seperti apa seh OS nya?